The redbud tree, Cercis canadensis, is a much-loved herald of spring in the eastern United States. Redbuds are adapted to life as an understory tree, thriving under the canopy of larger trees, making them one of the few trees that readily grow in shade. A mature specimen may reach up to 20 to 30 feet, with a graceful, spreading 30-foot crown. The redbud is valued as an ornamental shrub or small tree because of its tolerance of a wide range of conditions. The redbud is interesting even when it is not in bloom for the distinctive heart-like shape of its foliage. The leaves also bring color to the landscape since they are purple upon emergence, deep green in the summer and finally yellow in the fall. 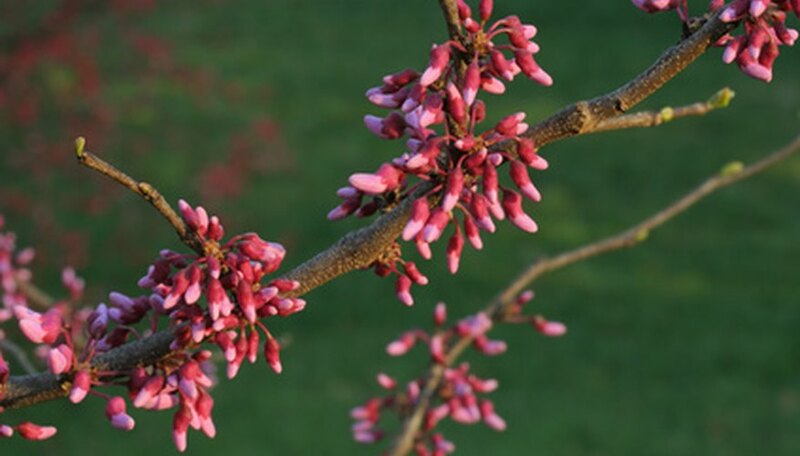 The redbud produces its pink to reddish-purple pea-like flowers even before other trees have leafed out, making it particularly welcomed in the springtime. The bark of young trees is smooth and gray, while older specimens develop a reddish brown coloration and an attractive scaly texture. According to the Missouri Botanical Gardens, redbuds are useful as specimen trees or in the shrub border, or in a woodland or naturalistic area. Their relatively small size make them useful in residential and commercial situations such as a narrow tree lawn, parking lot island or median strip. Redbud seeds are eaten by birds such as ring-necked pheasants, cardinals, rose-breasted grosbeaks and bobwhites, and by mammals such as white-tailed deer and gray squirrels. Bees rely on the nectar and pollen of the flowers of the redbud in the production of honey, according to the Western North Carolina Nature Center. The flower of the redbud is edible and can be used to add a nutty flavor to pancakes, fritters, salads and pickle relish, according to the Great Plains Nature Center. While they are still young and tender, the redbud’s seedpods can also be cooked and served like peas.